In Caper in the Castro, players take on the role of a lesbian detective, Tracker McDyke, searching for their friend and drag queen, Tessy LaFemme, who has gone missing from the Castro. Earlier reporting on this game from 2014 mistakenly listed Tessy as a trans woman. Those were based on 2014 interviews with CM, who had not seen the game in decades and so didn’t clearly remember the details of the game. She has told us to go with the language from the game itself (below). It was originally released as “Charity Ware,” meaning anyone who downloaded it was asked to donate funds to an AIDS organization of their choosing. Having moved from Southern California to the Bay area, C.M. wanted to do something for the LGBT community that had embraced her and her partner while also honoring the nearly 90% of their Southern California friends who had died from AIDS related illnesses. 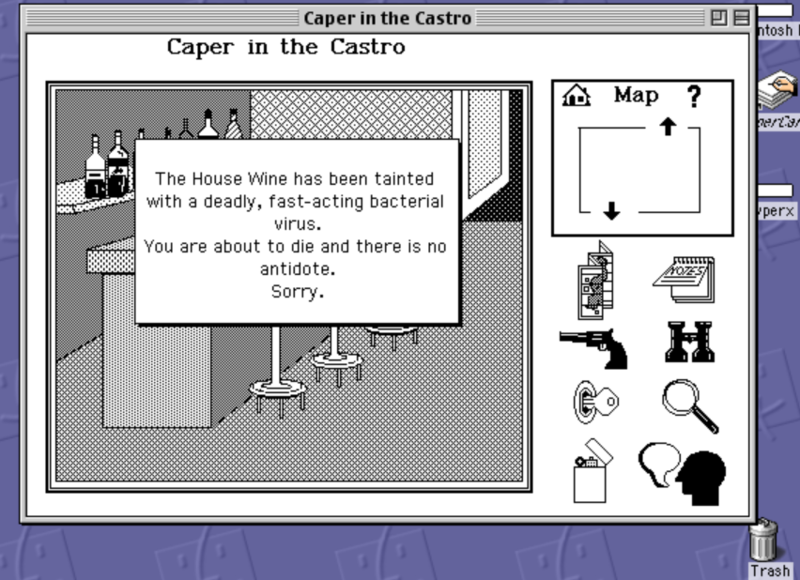 Also (*spoiler alert*) there is one plot line of the game about releasing a bacterial virus type agent in drinks at the local bars referenced in the game. The game was even covered by a reporter for the Washington Blade, Cynthia Yockey, who along with a 14-year-old boy was the only person to have solved it by November 1989. A copy of that article is available below. November 3, 1989 Washington Blade article about Caper in the Castro. 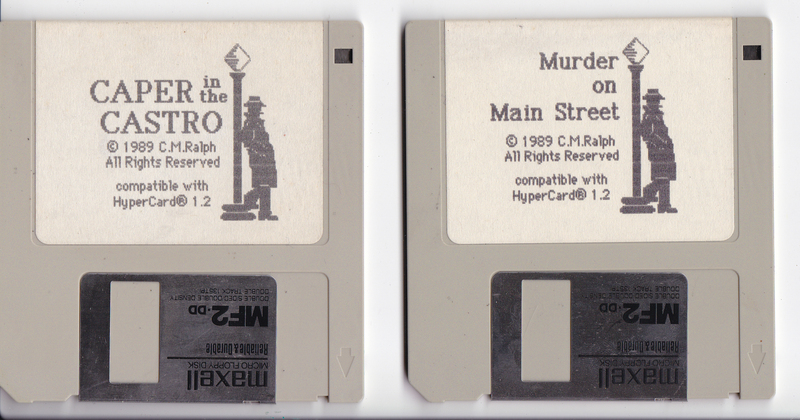 In addition, Ralph made another version of the game called “Murder on Mainstreet” and sold it through Heizer Software. Knowing an LGBT related game might not be picked up by them, she “straightened up” the game. Having been able to recently play both versions of the game, the changes include a name change for the protagonist and Tessy being cast as a model rather than a drag queen (see below). Moreover the couples at the Red Herring Café swap partners in the “straightened” version. Also, some of the clues and answers change. Moving this Summer CM found the original diskettes , and with the help of Andrew Borman and the Strong Museum of Play in Rochester New York, she and Adrienne Shaw were able to get the game in a playable format. Jason Scott at the Internet Archive then got it online, where you can play Caper in the Castro or Murder on Main Street. You can also watch a play through of the game here. CM Ralph is now retired from a 42 year career in manufacturing and can now spend all of her time working on her art which you can learn more about and follow here. Yockey, C. (1989, November 3). 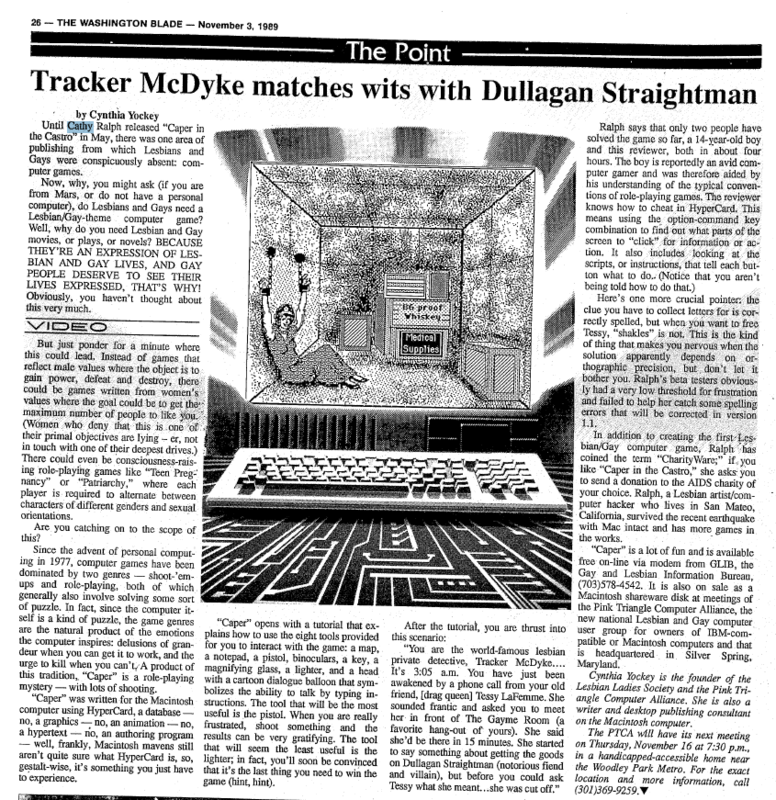 Tracker McDyke matches wits with Dullagan Straightman. The Washington Blade, p. 26.